Sakura Watch, April 6-8, 2012 - Sorry for late update posting! With preparations for Easter weekend, I still squeezed in some time for another walk through the park and have the photos to show you the progress and predictions on what to expect this weekend. I will say outright that it's looking like the full bloom will be definitely pushed into next week - my prediction is at least mid-week towards the 13-15th weekend. Throughout most of the park, the Sakura // Cherry Blossoms are still predominately in bud stage with the very few rare open blooms to see. Here are a few photos to look through, but keep reading below to see one possible early surprise! 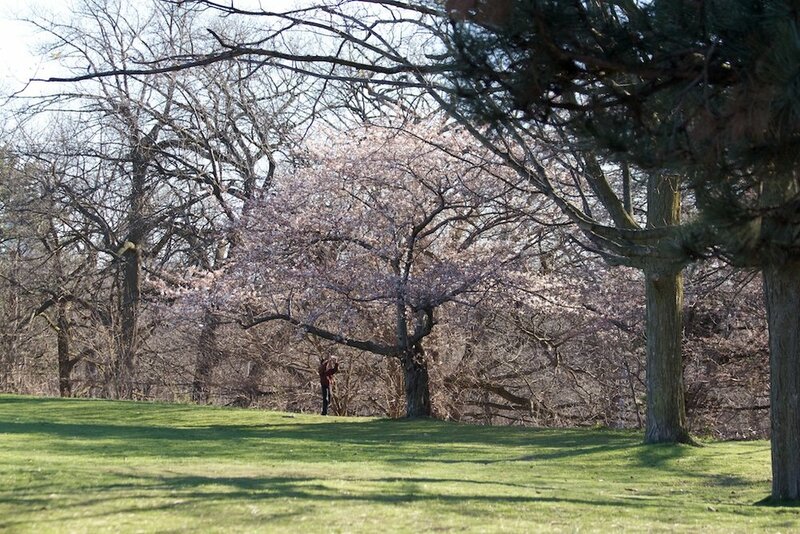 However, for those wanting to get an early start on seeing some new cherry blossom blooms for 2012, check out the trees nearest the High Park & Bloor entrance that is next to the soccer fields (right beside the roadway). Some of these trees are already close to 20% bloom and could possibly be even close to 50% by Easter Sunday, depending on the weather. The chance of rain on Sunday could more than dampen the mood of eager egg-hunters - it could also bring down the already delicate bloom petals beginning to open. The bright side is since most trees are still in the budding stage then those beautiful blooms will say well protected for many more, hopefully, sunny warm days ahead. I'll be adding a separate post about this weekends updates and other site goings-on, but I hope you enjoyed the photos from around the park today - April 6, 2012.